As I talked about in my last post, my kitchen is about 50 years overdue for an update. I swear, we don't do anything around here without thinking about it for at least 15 years, and then maybe give it another 5 for good measure. Unfortunately, the kind of update this kitchen needs isn't going to happen any time soon or probably ever. I'd rather leave that to the next owner down the line. But I can't live with it in its current condition any longer either. A few cosmetic changes will at least keep me from cringing every time I walk into the room, or turning red faced with embarrassment if someone else sees it for the first time. Number one on our priority list had to be the old Geneva metal cabinets. They consist of a six foot base unit for our vintage double drainboard sink and a set of upper cabinets. The bottom cabinets were in really bad condition, with considerable rust. It was an embarrassing eyesore that was impossible to hide. Here's a picture of one of the worst spots on a drawer front. I know...yuck. We don't have a dishwasher so when we hand wash the dishes they go into a dish drying rack that's just above that drawer. Water inevitably gets slopped around and drips under the edge of the drainboard there. In the cabinet directly under the sink there was adhesive vinyl on the bottom shelf. I hadn't planned on doing anything to the inside of the cabinets because they looked to be in fairly decent condition. But then I just had to go and remove the ugly blue contact paper, didn't I? Let me tell you, getting old contact paper off is not a matter of just pulling on a corner and pulling the whole works up in one go. Oh no! Just when you get a couple inches pulled up and think you're going to get a good run it suddenly snaps off...or breaks leaving pointy little edges that are hard to get hold of. I tried using a putty knife but that was no better than my now broken and dirty finger nails. I finally discovered, about halfway through, that a 6-in-1 painter's tool with a beveled edge worked like magic. I was able to scrap the second half off in about three minutes in nice big strips, as opposed to the forty minutes or so it took to get the first half off. But then I was left with this mess to have to deal with. Not only was there substantial rust but also the sticky adhesive residue from the contact paper. I really wish that stuff had never been invented! My first inclination was just to cover it all up with some more contact paper and forget about it. (Scratch that. My first thought was to run away from home.) Out of sight out of mind. But sadly there's no way my OCD would let me forget something like that once I'd seen it, so I knew my project had just gotten bigger. We had considered several options for rehabbing the cabinets including sending them out to be professionally spray painted or powder coated. But we really didn't want to invest a lot of money into something that is probably a temporary measure. It would also involve plumbing and having to remove the big cast iron sink, which my husband deemed too much of a hassle. For him anyway. I haven't avoided any hassle. Quite the contrary. I thought about trying to paint them with my spray gun. But I really haven't used it enough to feel like I've become proficient enough for this project. I also don't have a large dust free place to do the spraying. In the end, after tons of research and tips from others who have gone this route before, I decided to just go for it. Have brush, will paint. The first step was to remove the drawers, doors and apron piece under the sink. That process involved a fair amount of frustration since some of the hinge screws were rusted practically solid. It took a full week just to get the last door off, using WD40 and liquid wrench to loosen the screws. I then took everything I could outside for some long sessions of sanding that spanned several days, using both a power sander and hand sanding, to remove all the rusty areas down to bare metal and de-gloss the finish. If you do this be sure to wear a face mask and eye protection since old finishes most likely have lead in them. I did have to sand the base cabinets indoors since we weren't removing them. I covered everything I could with plastic and sealed the top cabinets with tape to keep dust out of them. I made sure all the windows and doors were open for ventilation. I also used a shop vacuum to clean up as I went to keep the dust mess to a minimum. Here are a couple of the doors after sanding. All the bare spots had been rust. If I'd been super ambitious and had nothing better to do with my life for the next few months I would love to have taken these all down to the bare metal and put a clear sealant on them. But I'm not that ambitious by a long shot. And then I discovered that rusty bottom shelf. Oh and there were some yucky looking wood dividers between the sink compartment and the side shelf units which I removed. We'll be replacing those with some type of water impervious material like plexiglass panels or something similar. Egads, I don't think the wallpaper really looks that bad in person! Or maybe it does. After thorough vacuuming I wiped everything down with a slightly damp rag and finished with a tack cloth to get any last bits of dust off before the prime coat. I was able to use aerosol spray primer on the doors and drawer fronts since the weather was conducive to doing it outdoors. I used a Rustoleum primer specifically for metal. For the base cabinets I went with Zinsser B-I-N Shellac Base Primer and Sealer . That stuff is amazing! It's expensive but worth every cent. I applied it with a good quality brush in the small areas and a foam roller on the flat end piece of the cabinet. I then went back and very lightly brushed over the rolled areas because I wasn't particularly happy with the orange peel texture it was leaving. You just have to be sure to do it fairly quickly because the primer dries quite fast. Within half an hour it was completely dry to the touch. If you want to see Zinsser's amazing awesomeness here is how that rusty bottom shelf looked after sanding and one coat of primer! I was not expecting that kind of coverage since the primer seems really thin and runny. You can also see that I primed the wall under there. The cabinets are open in the back and if you look at the picture up above you can see the awful pink color this kitchen was originally. That was before the awful mustard yellow which I'll get to show you once we strip the wallpaper off. You'll want to keep some sunglasses ready for that! With priming finally completed it was time for paint. The project up to this point, by the way, did not happen overnight. It was stretched out over several weeks. Yes, weeks! For one thing, just as I was about ready to start priming the temperatures soared into the hot and humid 90's. Not ideal for spray painting. After that we had rain. Then I took a week off to prepare for our thrift sale. By then I was starting to wish I'd never started the project. But it did give me time to consider altering my original plan to repaint the cabinets white. I started looking for inspiration on Pinterest, decorating blogs and design sites. 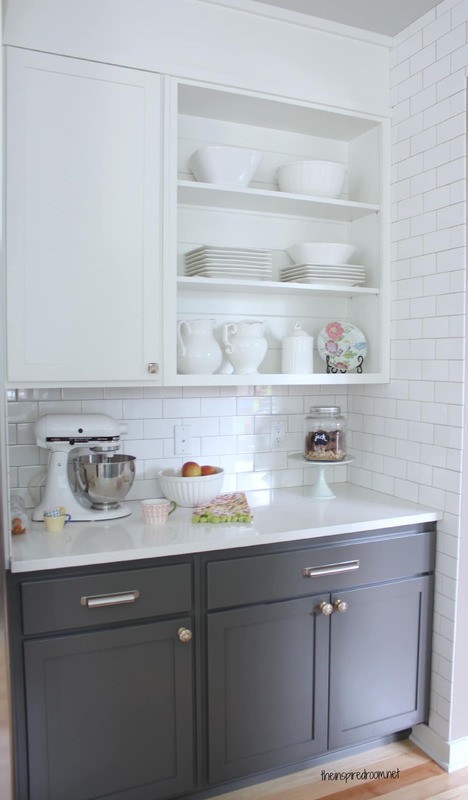 I kept coming back to gray and white kitchens, and then I saw this beautiful kitchen makeover over at The Inspired Room and it clinched it for me. I know I mentioned in my previous post that the kitchen is too dark already, so you're probably wondering why I would consider painting my cabinets charcoal gray. And you're right. For now it will only make things darker. But eventually we're hoping to paint our woodwork a crisp white and the walls will be painted something light. New flooring, etc., along with our white appliances should make everything lighter and brighter in the end. The color of the paint is Benjamin Moore Kendall Charcoal. It picks up the same tones as the stainless steel on my kitchen island and the gray cooktop of my stove. We'll be keeping the top cabinets white. I chose to use BM Satin Impervo Alkyd Low Lustre, which is an oil based paint. It's not available in some states, like California, that have strict environmental regulations. Eventually, I'm told, all oil based paints will be phased out everywhere. They do carry a waterborne version but I decided to go with the oil because of its reputation for durability. The oil also has a slightly longer working time before the paint starts to get tacky. It takes quite awhile to dry so you'll want to be aware of that. At about 70° it has taken 5-6 hours to be touchable without any stickiness, and at least a week to cure before I'll dare start putting things back in the cupboard. I used the same method as applying the primer, rolling and then back brushing. * The Satin Impervo smooths out nicely with very minimal brush marks. It has a nice satin finish that does a good job of masking any blemishes compared to a gloss or semi-gloss. I did two coats with a light sanding in between. The downside of course is the clean-up which requires mineral spirits instead of soapy water. There's also more odor with the oil paints so you may not want to use it if you have young children in the house or are concerned about the volatility. Again, the Satin Impervo is expensive but worth it. I think I paid just under $30 for a quart. It goes a long way and has amazing coverage. I was worried about using a dark paint over white primer but after one coat you can barely see any white showing through. If I'd known I was going to go this route I would have used a dark primer. I already had some Benjamin Moore Advance white paint (waterborne) leftover from a previous project to use for the inside of the cabinet. It's quite a bit cheaper than the Satin Impervo and is supposed to be very durable and not yellow over time like oil based paints will. Next I'll be painting the doors and hopefully this cabinet will be back in use soon. The upper cabinets are in much better condition than the lower ones. I'm not too eager to get started on those but if I want to do a tiled backsplash it needs to be done first. I don't think I'll have to do any sanding with those, or very little anyway. They aren't rusty, just a bit of wear to the finish and kind of dingy looking. A thorough cleaning with some phosphate free TSP and the Zinsser B-I-N primer will hopefully be sufficient prep, which will make the job go much quicker, albeit on a ladder which I don't like. I know once I have this part of the project done I'll be all the more determined to keep working on the rest of my kitchen. I'm looking at you, Wallpaper! Have you ever painted metal cabinets? Have they held up or did it turn into a disaster? After all this work I'm keeping my fingers crossed that they'll buy us a few more years of use. *I wasn't very happy with the roller and in the end decided to just use the brush. The supposedly lint free roller that was recommended to me actually left a lot of lint and the foam roller gave it too much texture. I'm going to add some Penetrol to the paint before I do the doors to increase the work time and help the paint level out even more smoothly. Click here to go to Part 2 of painting metal cabinets.